83,000 people are now homeless and without permanent shelter, more than half of which are children. Children like Lisa, age 3. Lisa lived in the Balaroa province of Sulawesi – one of the worst sites affected by earthquake liquefaction. Lisa was swallowed up into a hole that formed beneath her home. She was trapped for more than 5 minutes before her mother was able to save her. Lisa and her mother survived, along with her two brothers and sister. But for two days the family were without shelter and had to sleep out in the open, unprotected. To overcome this crisis, UNICEF is helping families like Lisa's with food, water, medical, shelter and sanitation services. We're also reuniting children and families, and setting up temporary learning and child-friendly spaces, such as The Happy Children's Centre. Services at our centres are vital to help children learn, play and recover from trauma. Lisa attended the Happy Children's Centre with her brothers and sister and is now back to speaking and playing again. Yet there is still so much work to do. An estimated 1.5 million people have been affected by the disaster, over half of which are children. They urgently need our care and protection. 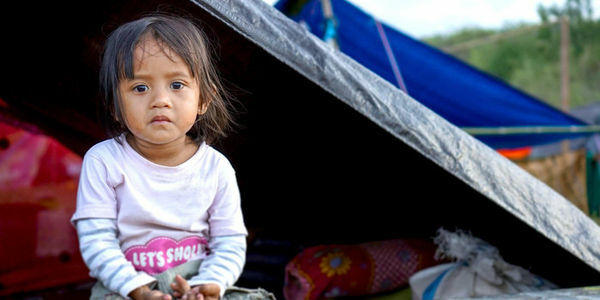 Please add your name to raise awareness of this crisis and help Indonesian children overcome the trauma of the Sulawesi disaster.